Surfshark is a new player on the VPN scene , and its start looks promising when checking reviews of well known VPN specialised websites. This review of Surfshark ONLY deals with its Mac application as we only review Mac related applications and programs. Safety is a main concern when dealing with VPN’s as you need to be sure your privacy is guaranteed by the provider, well since they’re based in the British Virgin Islands they aren’t obliged to keep any logs! Price-wise Surfshark is giving some huge discounts right now, probably to set itself in this market and attracts new users looking for a good VPN provider. We’ve been testing out Surfshark to see how it performs and checked its connections, safety and service. To make your search for the best VPN provider a little easier, I will try to sum up some issues related to normal internet use and explain their importance in relation to your safety. First of all you don’t need to be doing illegal stuff on the internet to make you want a VPN, as ordinary users have an even greater risk surfing the internet as they are not always aware of the tricks being used to steal information. If you’re using Wi-Fi which you probably will, you’re more exposed to the outside world then when using cable-network. 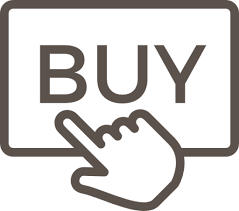 Reading a simple online-newspaper which shows you advertisements between the lines always establishes a connection with your IP-address just in order to show the images. Reading your emails which many times include images and links transfer your IP-adress to external servers filtering your behavior. To make it simple YOU’RE EXPOSED to the world. For all doing the wrong-illegal stuff on internet like downloading films and music there’s a simple warning. Stop doing what you do..or get fined …or get a VPN to make yourself invisible to the outside world. Any VPN which has its base location in the USA is not fully safe proof. They have to deal with severe law regulations regarding logging of users and there internet use. So the first thing you need is a provider NOT LOGGING any IP or online activity! Simple and safe. 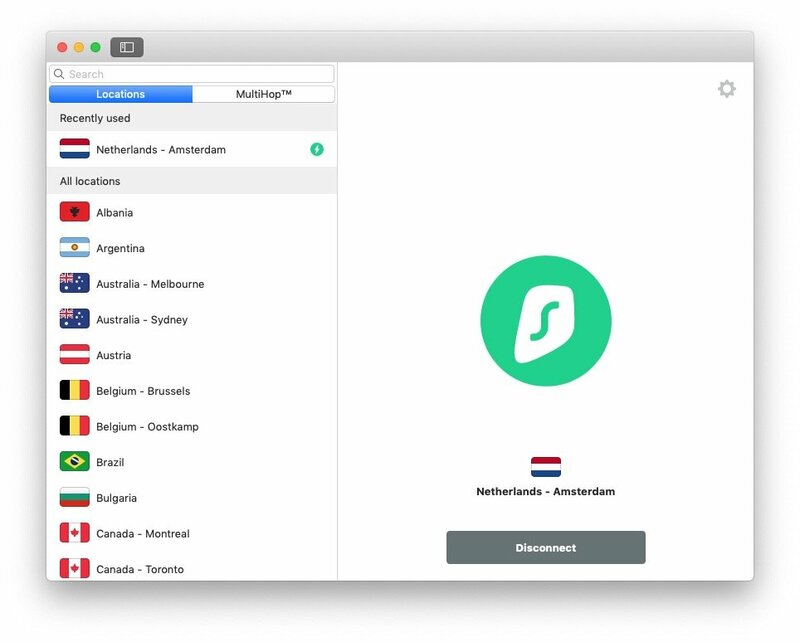 Surfshark VPN for Mac doesn’t need any installation tricks or additional settings ( its windows application is different to Mac ). Just drag the application in your applications folder and you’re set to go. The preferences are limited and do not show any protocols to choose from, just a kill switch ( which you should use! ), and some minor settings. Its really simple to use, as you only need to pick your desired country-server from the list OR choose any Multihop server available. Simplicity: Everything’s robust on the inside but as simple to use as turning on WiFi. Unlimited devices: One account for you and your whole family. Diamond-strong protection: We guard your personal data using industry-leading encryption. Kill Switch: Our safety net in case your connection is compromised, so your activities and sensitive data are never exposed. MultiHop: The best way to hide your online activity with a double VPN chain. CleanWeb™; No ads, no trackers, no malware. Enhanced browsing experience for your peace of mind. Friendly Support: Our eager-to-help team is here for you 24/7. Strict no logs policy: Based in the British Virgin Islands – we don’t monitor, track or store your online activity. Privacy over public WiFi: Stay safe while traveling or dining out in the city. IP masking: Surfshark masks your IP address, so it’s impossible to link it to your online activity via IP detection. Zero-knowledge DNS: Private DNS on every server leaves no cracks for potential security breaches. A VPN protects your privacy by creating a secure “tunnel” across the Internet between you and your Internet destination. This tunnel is created by first authenticating your client–a PC, tablet, or smartphone–with a VPN server. The server, which you can run yourself with programs such as OpenVPN, then uses one of several encryption protocols to make sure that everything sent between you and websites and Internet services can’t be monitored. It does this by creating an encrypted tunnel, which is like putting a package into a box and then sending it to someone. Nobody can see what it’s inside the box until it’s opened/decrypted. An encrypted VPN tunnel – image credit: Check Point Software. These VPN protocols run as a lightweight server program. VPN providers run multiple VPN servers on virtual machines (VMs) or containers. This enables them to serve tens of thousands of clients from their data centers without spending a fortune on servers. You normally can’t choose which protocol to use within the VPN software itself, but you can certainly choose a VPN that offers one of the more secure protocols. message integrity to detect any instances of tampering with transmitted messages. Transport Layer Security (SSL/TLS) can tunnel an entire network’s traffic (as it does in the OpenVPN project and SoftEther VPN project) or secure an individual connection. A number of vendors provide remote-access VPN capabilities through SSL. An SSL VPN can connect from locations where IPsec runs into trouble with Network Address Translation and firewall rules. Datagram Transport Layer Security (DTLS) – used in Cisco AnyConnect VPN and in OpenConnect VPN to solve the issues SSL/TLS has with tunneling over TCP (tunneling TCP over TCP can lead to big delays and connection aborts ). Microsoft Secure Socket Tunneling Protocol (SSTP) tunnels Point-to-Point Protocol (PPP) or Layer 2 Tunneling Protocol traffic through an SSL 3.0 channel (SSTP was introduced in Windows Server 2008 and in Windows Vista Service Pack 1). Multi Path Virtual Private Network (MPVPN). Ragula Systems Development Company owns the registered trademark “MPVPN”. Having a closer look at its interface I was wondering which protocol was active when a connection was made. I expected to be informed somewhere in the menubar or whichever. Nothing found just that best connections are made based on the connected server. Strange and not good, if you seek best safety on the internet but unaware of its running protocol. So this was a good opportunity to test Surfsharks online chat function for its knowledge and response time. Windows uses all of the mentioned protocols. As for the other OS – it’s currently IKEv2 only, so Mac runs IKEv2. So, good to know that Surfshark ONLY uses IKEv2 on our Mac’s which is good as it is with Open VPN the best solution in terms of safety. to download a certificate and Surfshark OpenVPN config files. 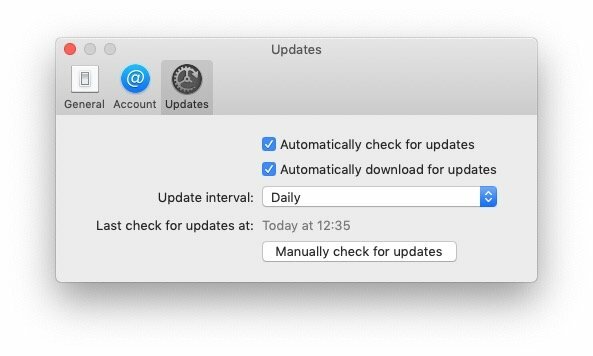 This way you create your own VPN connection in your system preferences and provides you some extra connection protocols to choose from. 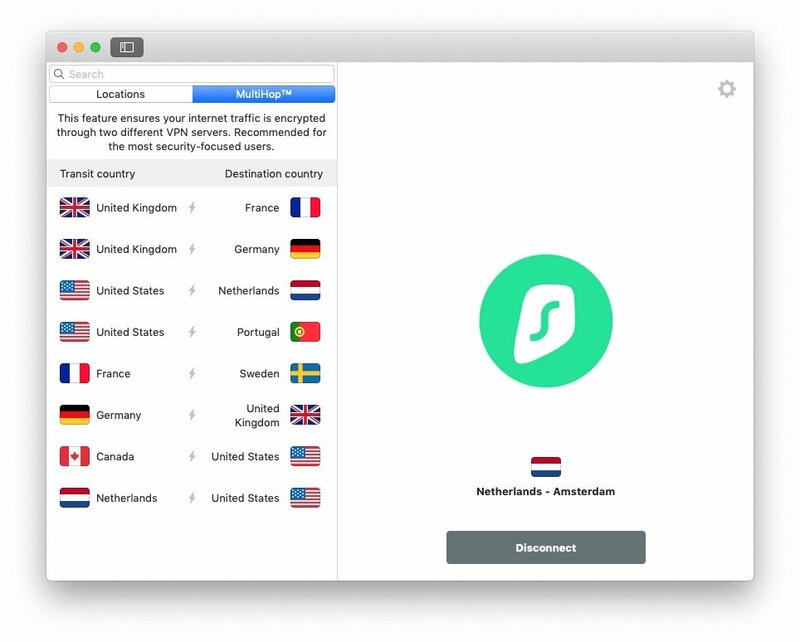 SURFSHARK VPN, comes with some extra features not encountered on any other VPN providers list. There will be some I guess, but haven’t tested all available providers. One new feature is CleanWeb™, which protects privacy, blocks malware, trackers and ads while surfing the internet. Great but will also sometimes block a wanted connection, however most of the time it worked really well. SURFSHARK VPN MULTI-HOP, A double VPN feature, when in use, tunnels your traffic via two VPN servers. MULTI-HOP adds an extra layer of protection for the extra privacy-conscious user, although it will slow down internet traffic. Surfshark uses traffic obfuscation on OpenVPN traffic to help cloak your VPN connection and enable you to bypass restrictions on VPN usage. 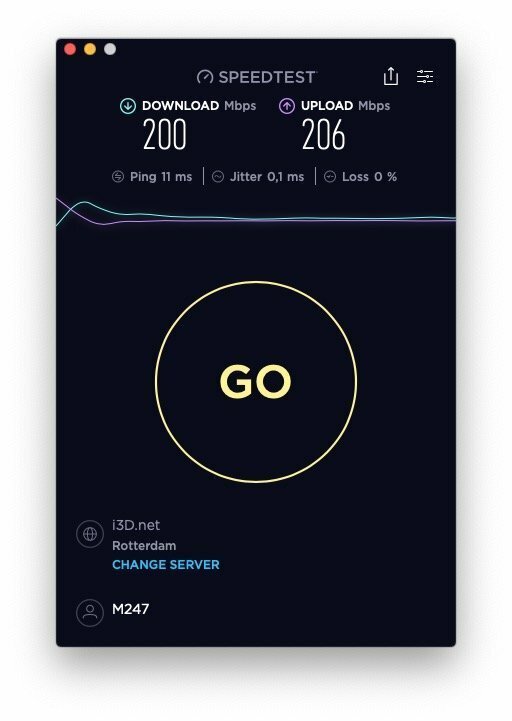 This is only to be discussed based on my own experience over some days of use, and servers chosen in The Netherlands as they provide highest speeds for us. The stability was really almost perfect I must say, a connection was never dropped and our computers run 24/7, so very satisfied about stability. Speed is a different matter for any server location I guess, we run on glasfiber connections and other countries may have different signal transmissions. Our connection speed was fantastic really not much lower than possible for us. Surfshark VPN uses 256-bit AES encryption, which is the highest encryption available this is in conjunction with an SHA512 authentication hash and 2048-bit DHE-RSA key exchange. So you need not worry about your safety and privacy. There are two protocol options: OpenVPN and IKEv2. Surfshark took some good measures and DNS, IPv6, and WebRTC leak protection are built in. Surfshark uses private DNS servers instead of public ones, so you’re covered for tracking your DNS requests. Surfshark VPN is a great performer all the way. Safety is guaranteed as is your privacy. Data and connections are unlimited, P2P is allowed, and they serve a no-logs policy. Its Mac application is somewhat limited in choices but provides a kill switch, and (not visible)DNS, IPv6, and WebRTC leak protection. Additional features are CleanWebTM, WhitelisterTM, multihop servers, and traffic obfuscation. Speed and stability are really great ( well the ones we checked, ut this may vary ) and the ease of use makes this product a true great and new contender in a crowded market. Its pricing and service are among the best around, so if you’re in for a VPN, check out Surfshark.